Gluten-Free Living > Tips > What recipe should I use for Taco Tuesday this week? What recipe should I use for Taco Tuesday this week? A heaping pile of vegetables meets up with black beans, corn, tomatoes and spices before being scooped into corn tortillas for Calabacitas and Black Bean Tacos. 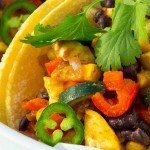 These gluten-free, vegetarian tacos quick and easy to make, but can be enjoyed all evening with a delicious beverage.